In just under 400 pages including endnotes and citations, London-based journalist Hari weaves together the origins of the American war on drugs with the stories of dealers, police officers and doctors forced to operate under the often draconian (and, even more often, implicitly racist) laws borne by it. He also explores how other countries—including Canada, Switzerland and Portugal—regulate substances and how they deal with addiction and recovery. Like I said, there is so much to discuss here, but, instead of trying to summarize all of it, I'm going to leave you with three of the most interesting (and infuriating, and disheartening...) facts I learned while reading. 1. The racist impetus of changing gun laws. In the 1920s, police forces in the Southern states increased the caliber of their guns because "[c]ocaine was, it was widely claimed in the press at this time, turning blacks into superhuman hulks who could take bullets to the heart without flinching" (pg. 27). This is not the first book I've read that discusses how drug law enforcement is disproportionately focused on people (especially men) of color due to political/media fearmongering (e.g., The New Jim Crow, Just Mercy), but this particular example of a racist falsehood giving birth to new legislation stopped me in my tracks early on in the book. 2. The follow-up experiment no one knows about. Some of you might recognize this "cocaine rat" ad, funded by the Partnership for a Drug-Free America in the 1980s. It's based on scientific research that showed that, when given unlimited access to cocaine, rats will use and use and use up until the moment they drop dead. Psychology professor Bruce Alexander was skeptical; he noticed that, in all of these experiments, the rats "had been put in an empty cage. They were all alone, with no toys, and no activities, and no friends. There was nothing for them to do but take the drug" (pg. 171). Enter Rat Park. Alexander created an "amusement park" for rats, full of activities and other rats in addition to the drug dispenser. He also ran a control condition that replicated the original rat studies. Amazingly, he found that the rats in Rat Park used significantly less morphine than the rats in the isolated cages. "They don't kill themselves. They choose to spend their lives doing other things" (pg. 172), Hari writes. Alexander's findings threatened the very foundations of our understanding of drug addiction. While the "chemical hooks" in a drug certainly play a role in addiction, environment and social support is just as (if not more) important in determining one's propensity to become an addict. Alexander attempts to get his results published were met with rejection from top-tier journals. Alexander was told by a higher-up at his university that his results were "embarrassing" (pg 179). Funding for his research was cut off, and no researchers since have received grant funding to replicate the original Rat Park study. I'll just leave you to ponder that one for a while. 3. Surprise! The father of the drug war "dealt drugs" and became an addict himself. Harry Anslinger, head of the Federal Bureau of Narcotics and the man behind the earliest calls for action against "the marihuana evil" (pg. 16) and the menace of the drug-addicted black man, ensured that an influential (white) member of Congress had access to his drug of choice: heroin. "The bureau even picked up the tab until the day the congressman died" (pg. 297-298) and blocked journalists that attempted to break the story. Toward the end of his life, Anslinger became addicted to morphine to treat his angina. I can't even attempt to swallow the amount of hypocrisy here. 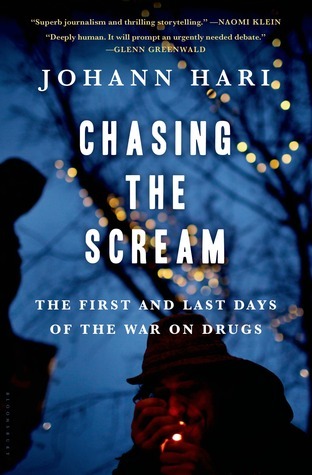 If you have any interest in learning about the long, sordid history of the war on drugs, the impact drug laws are still having today, and the ways other countries navigate drug regulation, I implore you to pick up this book. I know at least a couple of you have read Chasing the Scream. Talk to me! I totally wanted to read this back when Kerry mentioned it and you reminded me why! It definitely sounds like one of those books that will make you furious but feel pretty necessary at the same time. This sounds so fascinating -- and infuriating. Must read! Please, please do! I'm currently on the hunt for more books in this vein. Such a good mix of solid research, reasoning and storytelling. My nonfic tbr just keeps growing and growing. This seems like one I'll be afraid to try because it could be so infuriating. A worthwhile addition, I promise! It's infuriating but also devastatingly human... Hari does a fantastic job fleshing out the players in this story.